Nintendo recently reported earnings for its fiscal third quarter of 2017, including data related to the company's two-year-old smartphone game business. In the report, Nintendo confirmed that its smart device and intellectual property related earnings increased from 10.6 billion yen (about $98 million) in the nine months ended December 31, 2016 to 29.1 billion yen (about $267 million) in the same period in 2017. While this includes income from Nintendo's smartphone games as well as royalty income, Bloomberg reported that Nintendo's smartphone game profits specifically grew from 8.8 billion yen in the year-ago quarter to 11.2 billion yen this fiscal quarter. 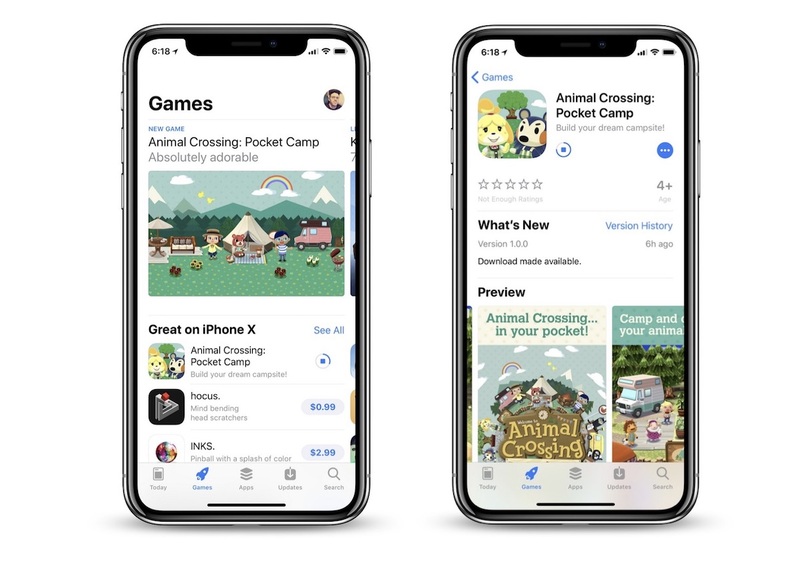 The only smartphone game that launched this fiscal quarter for Nintendo was Animal Crossing: Pocket Camp, which is said to have generated $17 million globally and reached a download number of 22 million since its launch in November. The other major smartphone game to debut from Nintendo in 2017 was Fire Emblem Heroes. Nintendo said it plans to get its players to continue returning to and enjoying previously released iOS and Android games through ongoing updates, not including the recently confirmed imminent shut down of its first iOS app Miitomo. In our smart-device business, consumers not only continued to enjoy Super Mario Run and Fire Emblem Heroes, which became available for download during the previous fiscal year, but also had fun with Animal Crossing: Pocket Camp, released globally during October and November. Smart devices and IP related income were up to 29.1 billion yen (172% increase on a year-on-year basis). Although Fire Emblem Heroes and Animal Crossing: Pocket Camp are free-to-download apps, they're believed to net Nintendo more of a profit in the long run thanks to players who become enticed to spend money on in-app purchases. Alternatively, Super Mario Run is a free-to-start app where users can play a few levels and then must spend $9.99 to gain access to the full game. At one point, Nintendo described the freemium model of Fire Emblem Heroes as an "outlier" in its overall smartphone game plan and that it prefers Super Mario Run's pay-once structure, but so far that's been the only app to go that route. Additionally, the company's previous earnings report mentioned Super Mario Run had yet to reach an "acceptable profit point" around 10 months after launch. Otherwise, Nintendo's earnings report detailed a huge success for the company's Switch console, selling 12.13 million units from April to December 2017 and now totaling 14.86 million units sold to date. Upon this report, Nintendo increased its operating profit outlook from 120 billion yen to 160 billion yen for the year ending March 2018, and bumped up the Switch sales forecast from the already-surpassed 14 million units to 15 million units for the same period. You're welcome, Nintendo. I'm a Pocket Camp addict and I am sure I contributed to some of that profit buying leaf tickets. :D The game can easily be enjoyed without spending a dime, but I'm a nut. I went crazy for the Rover set. I have some great friends who helped me get all the butterflies necessary to complete the set. Most of my friends apparently are Japanese. I had to download kana charts to refresh my memory on how to read the characters so I could learn their screen names properly. edit: I'm surprised that this is generating much revenue (although the article is reading tea leaves and it may also be disappointing their targets). Until recently it was hard to see where people would spend money on the game given how easily you can obtain the in game currency and how relatively expensive it would be to purchase small items with real world money. Over the past few weeks they seem to have really cranked up the difficulty of spawn and catch rates which to me seemed like an attempt to force people into paying for leaf tickets to complete events. It seemed like a sign of desperation and an indicator that the game was not close to targets. More "tea leaves" though and we'll have to wait for a more concrete statement in a future earnings call. As a person who plays the game though I think they've struggled to (and really haven't yet) achieve balance. Nintendo is learning what mobile content creators have known for years. Freemium is the de facto mobile commerce model. The loud minority (I am one of them) rail against IAP. The silent minority continually spends copious amounts of money on the exact thing we rail against. If Nintendo remains in mobile, I'd bet more of their offerings will lean towards the freemium model than the pay once model. The failure rate for the butterfly capture (to get the Rover set items) was definitely high enough to trigger Rover maniacs like me who wanted the complete set to buy leaf tickets to give to the Lloid to ensure all the butterflies from a given crop of flowers was caught before the expiration date. I also wanted to have enough butterflies on hand to help some of my friends make their goals. I saw only a very small few players who managed to get everything in the set like I did. And I know I did that with the help of leaf tickets. I could definitely tell I was being manipulated but I factored it into my entertainment or “mom budget”. I have sort of a rough idea of what my peers are spending on lunches and spa dates and salon appointments and designer what’s-its and since I don’t indulge in any of those things, I put my me-budget to getting the Rover camper. Lol. It still must work out to a lot less than I begged off my mom in quarters to play Centipede and Galaga in the arcade as a teenager! As I was playing and tallying up what I spent on leaf tickets the past couple of months I did wonder how the game was performing for Nintendo. I hope it’s a success because it’s a lot of fun (for the right personality—the hubby and kids can’t get into it at all) and I want to see them continue to build on it and make more games for the smart phones. I have a Nintendo 3DS XL and hope to get a Switch someday. But it’s definitely convenient to be able to game on my phone. I like the game a lot too. A lot of nostalgia factor for me. Being able to pick it up for eight minutes here and there to do a round of requests and then put it down again is nice with my busy schedule (say compared to trying a block out a couple hours to raid in WoW, I can't be a real gamer). I completed the Rover event too but I had to consciously do those rotations rather than just be random about it (I wanted the challenge of completing without Lloyd :) ). Bats have a better catch rate and should be about 20% easier to complete than Rover's challenge. Still going to be a grind though! edit: just saw we only need 25 of the final bat for the Lottie event. No grinding, it will be easy. I tried Animal Crossing Camp but did not enjoy it. Granted I only played for maybe up to an hour in its opening week. What that experience told me though was to get back into Animal Crossing New Leaf on my 3DS. And boy was it a good reminder of that game.... I bought it back in 2013 and had put 400 hours into it but stopped playing maybe a year ago. However I’m back addicted to it. New Leaf is such a beautiful game I cannot wait to get the inevitable Switch version. As far as Pocket Camp goes.... well it’s too shallow for me but I understand the desire for simple shallow games. I understand not everyone can put as much time into games as others. It’s worth noting Nintendo have had an incredible year thanks to the Switch and a boom in 3DS sales thanks to its new discounted price. I believe I read somewhere it’s the best year they’ve had in 8 years as the Wii U flopped. I simply can’t believe how good the Nintendo switch is though. By far the best video games system ever made its that good!